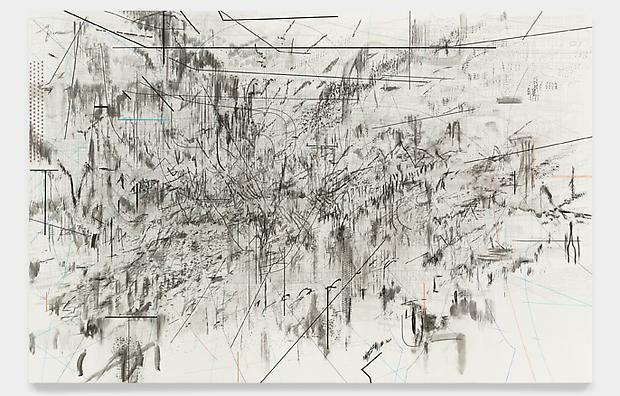 With their blueprintlike underdrawings of sites in the Middle East, partly obscured by stipplings of ink and acrylic, the latest paintings by Julie Mehretu allude to mass demonstrations and other current events in that region. Yet they don’t look all that different from the paintings she exhibited at the Guggenheim in 2010, as the Arab Spring was just starting to gain momentum. 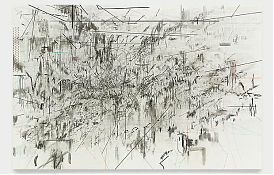 This steadiness is not entirely surprising; Ms. Mehretu has always been an artist of tipping points rather than cataclysmic changes. She works slowly, much more so than many of her peers, and her paintings aspire to show not only sweeping revolutions but also alterations to the urban fabric that take place over centuries. “Ra 2510,” for instance, collapses contemporary stadium architecture onto the Gates of Babylon. All of the paintings superimpose clusters of short brush strokes and the occasional sweeping vector over intricate architectural plans and elevations, staging a contest between two kinds of drawing or, as T J Demos writes in a catalog essay, “between architecture and gesture, between representation and abstraction.” In these new works the top layer seems to be winning, or at least vying harder for attention; it’s loose and glyphic in “Co-Evolution of the Futurhyth Machine (After Kodwo Eshun),” and pixelated in “Insile” (which is further distinguished by a floating white trapezoid). The bottom layer might be a floor plan of a mosque, an ancient city map or a panoramic street view. It almost doesn’t matter, except in the mesmerizing, mural-sized “Beloved (Cairo)”; here, clouds of ink and acrylic part to reveal a clear outline of Tahrir Square. It’s a rare grand gesture in a show that’s best characterized as an accumulation of small ones.